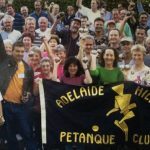 The Adelaide Hills Petanque Club is a community run sporting club offering fun, camaraderie and personal challenges for all members of our community. 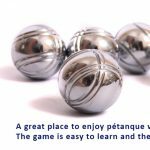 Pétanque (pronounced pe’tonk) is a form of boules where the goal is to toss or roll hollow steel balls as close as possible to a small wooden ball called a cochennet (similar to a jack used in the game of bowls), while standing inside a circle with both feet on the ground. The game can be played at everyone’s convenience as we play all year round by nearly all ages and physical abilities/disabilities at the same time. Loads of fun, come give it a try! All visitors are made to feel welcome, our members will be only too happy to give you a few tips, plus we have plenty of spare equipment for you too, just bring yourself along and have a go. Hope you can join us.